Like with humans, there are red flags for dogs that indicate sickness. A number of worms are capable of causing serious problems for dogs. Among them are hookworms, tapeworms, roundworms, whipworms and heartworms. These nasty parasites are transmitted through mosquito bites, food, soil or even mother’s milk. Roundworms (ascarids) are the most common worms that infect dogs. While seldom fatal, they can severely weaken puppies. Adult dogs are essentially immune, but larvae of dormant worms can be transmitted to puppies in the womb. Dams should be dewormed before breeding to prevent transmission. Hookworms thrive in hot, humid conditions. They feast directly on dogs’ blood, and can severely weaken infected animals. Like roundworms, hookworms can be transmitted through the placenta during gestation, or after birth, through mother’s milk. They can even burrow directly through the skin of the paws. Your family veterinarian can detect the eggs of these parasites in your dog’s stool. Whipworms lay fewer eggs than other worms, making detection more difficult. But once in the soil, eggs remain infective for up to five years. They can cause acute, chronic or intermittent diarrhea in dogs. Scratching, licking or biting the skin; hair loss; hot spots. Possible cause: Fleas. Within just three short weeks, a single flea can infest your dog with more than 1,000 blood-sucking descendants. 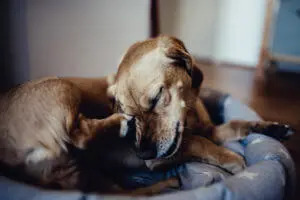 While uncomfortable for your dog (and your unprotected ankles) fleas can also cause problems such as anemia, allergic reactions and infections. Fleas can also transmit tapeworms. Bare, inflamed red patches on the skin. Possible cause: Acute moist dermatitis (hot spots). Hot spots are inflamed patches of skin that may weep pus and exude a foul odor. These problem areas may be related to allergies, mites, parasites, poor grooming, etc. Topical steroids or antibiotics may be required to address this painful condition. Vomiting, drooling, abdominal heaving, anxious behavior. Possible Causes: Numerous. Dogs are scavengers with a well-developed ability to throw up. This helps prevent poisoning or ingestion of indigestible substances. If vomiting occurs more often than once a day, or for several days, seek a veterinarian’s help. 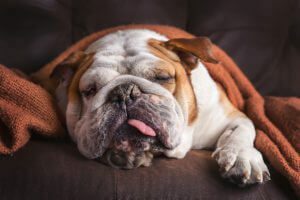 Other signs of trouble include abdominal bloating, frequent dry heaving, bright red blood (or a substance resembling coffee grounds) in the vomit, and vomiting that occurs even when your dog has not eaten for several hours. Diarrhea; watery or loose stools. Possible cause(s): Numerous. Dogs can get diarrhea from something as simple as a dietary change. Occasional diarrhea, lasting no more than a day or two, is common. If it persists or becomes bloody, see your family veterinarian, as your dog’s symptoms could lead to dangerous dehydration. Causes include anything from ingestion of spoiled food to allergic reactions, to infection with parasites or even ingestion of a foreign object.